LMU musicologist Hartmut Schick is leading the effort to produce a modern edition of the works of Richard Strauss. The first volumes afford unique insights into the composer’s mastery of orchestration, and will inspire new interpretations. The mammoth project, which began in 2011, will for the first time collect and collate all available versions of the compositions written by Strauss during his lifetime and authorized by him for performance. The scores used in modern performances are all based on the first printed editions, which have simply been reprinted over the years and thus retain the errors introduced during the initial process of production. “Our aim is to present the works in precisely the form the composer intended – a task that was never satisfactorily accomplished in his lifetime,” Schick explains. In other words, he and his colleagues want to provide nothing less than the best possible text of each work, based on the best sources available. This endeavor will undoubtedly have an impact on their future performance and interpretation. For instance, one of the upcoming volumes in the series will include a version of the opera Salome, which has never before appeared in print, and was last performed in 1940. Strauss originally undertook the so-called Dresden Revisions for a production at the Semperoper in that city in October 1930. The changes in the original score were made primarily with a view to making it easier for the singer of the title role to make her mark in often densely scored orchestral passages. “He thinned out the orchestration and reduced the dynamics to enable a lighter and more flexible voice to penetrate the orchestral texture,” Schick says. In doing so, Strauss also opened up the role for a different type of voice – lyrical, more agile and lighter than the highly dramatic and voluminous voices that had been required up to that time – because he saw his protagonist as a much younger, less mature and more child-like figure. “That is a quality that will certainly come into play in future productions of the opera,” says Schick. The new editions of other works will also lead to reconsiderations of issues of interpretation. “Our work on these volumes is complete, and the publishers will now produce practical performing editions. That will also make our editions of these scores more widely accessible,” says Schick’s collaborator Dr. Andreas Pernpeintner. Richard Strauss was born in Munich in 1864, and enjoyed early success as a composer. As a young man, he rapidly won a popular following, and went on to become one of the most successful and most frequently performed classical composers of the 20th century. By the time of his death in 1949 at the age of 85, he had composed nearly 500 works. But his compositions were not unanimously admired by his peers and contemporaries in the music world. “Many were offended by Strauss’ continued allegiance to the long established tonal system of composition at a time when the barrier to atonality had already been decisively breached,” Schick explains. But this negative assessment has undergone significant revision over the last few decades: “When Strauss is seen in the light of post-modern music, which is quite happy to draw on older styles and ‘renovate’ them by distorting them in certain ways – without being decried as old-fashioned or reactionary – one can argue that he was already a postmodern composer before the term had been invented. For many of today‘s composers he has become a point of reference. They are now willing and able to admire Strauss’ compositional craftsmanship and the complexity of his scores,” Schick says. It is therefore high time for his scores to be re-examined with the philological care that is commensurate with their historical significance. Interest in the composer has also increased among international audiences. 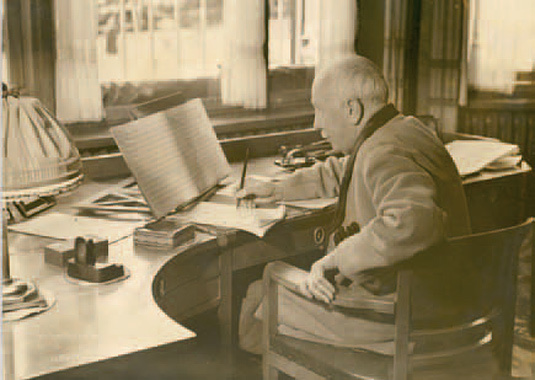 “In the past 10 or 15 years, Richard Strauss’ music has experienced something of a renaissance, and is particularly popular in Japan and the USA.” This is reflected in usage of the website: More than a quarter of visitors live in Japan. “This underlines the international significance of the whole project,” says Schick. This first Critical Edition of the Works of Richard Strauss is receiving long-term funding from the Bavarian Academy of Sciences over a period of 25 years. This timespan may seem excessive to many. But given the size of Strauss’ oeuvre, it actually sets a tight schedule for the musicologists. “The task of comparing musical scores which, in the case of the operas and orchestral works, may consist of up to 44 staves, is incredibly demanding,” Schick points out. In addition, the editors have to survey and transcribe the composer’s correspondence with collaborators, publishers and conductors. He wrote up to 10 letters in a day, and some of these may include information concerning errors, or alterations and cuts which he authorized for specific performances. His surviving correspondence consists of several thousand letters, all of which will be documented in the course of the project, and will ultimately be made available in a dedicated database which will be open to the public. The editors’ arduous task of painstakingly comparing scores and checking markings relating to dynamics, articulation and expression receives its rewards in the insights it yields into the workings of the composer’s mind – as in the case of the different versions of Macbeth: “As an editor, one sifts through and pores over the notes again and again, and then there are these magical moments when one recognizes that Strauss has done something out of the ordinary – and realizes why. These changes are usually minor, but their overall impact is so striking that it represents a huge step forward. Each one is a textbook example of compositional technique, and every student of composition should be confronted with them,” says Dr. Stefan Schenk, editor of the Macbeth volume. Professor Hartmut Schick holds the Chair of Musicology at LMU. He is Editor-in-Chief of the Critical Edition of the Works of Richard Strauss, which appears under the auspices of the Bavarian Academy of Sciences. The project, which is based at LMU Munich and began in 2011, is funded by the Academies Program, which is financed jointly by the Federal and State Governments.